Would you like to travel more mindfully so exotic lands and otherworldly experiences still feel real years later? Join me for my “Creative Travel Workshop” in Fez, Morocco, and learn to record travels so they forever transport you back in time. A year into nomad travels, and I can tell you that sentiment in this photo rings true from my own experience. Luckily, I force myself to stop and write, and I’m so glad I do, or all my experiences would blend together in a hazy whirlwind. After all, there’s no greater blink-and-you’ll-miss-it experience than the trip of a lifetime. That’s why I’ve made it my new mission to help people unlock the art of creative travel. Whether basking in Tuscan sun in the countryside or watching the madness of a Moroccan souk, much slips away in the years that follow. Memories, it turns out, are but flashes in time, a picture of a moment, not the sum of an experience. What if you could record it all in a travelogue to savour in decades to come? And what if, when older and reflecting on a life lived well, you could pull out records of all the trips you’ve ever enjoyed, read, close your eyes, and be transported back there? What if, when your children are grown with kids of their own, they had your travel memoires to cherish as part of your legacy? Simply put, mindful travel is elusive for most of us. A lovely goal, but so many of us become entrenched experiences. 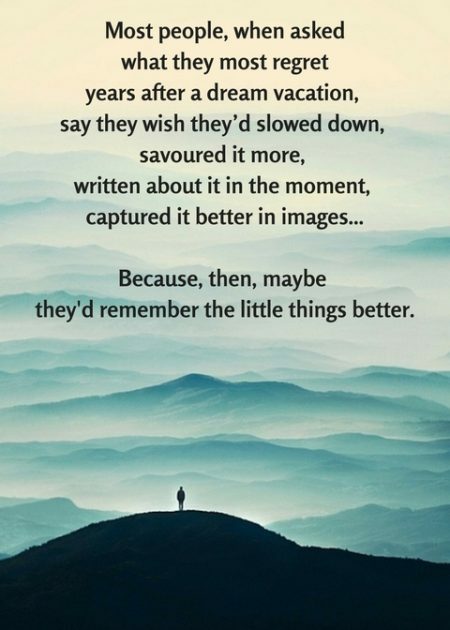 We forget how much can be enjoyed in just watching a moment, rather than being lost inside it. We like to believe an experience is unforgettable, but we’re humans, not machines, and the human mind is a mystery. Some memories stay, some go. But for an accident or illness, it takes little for a moment to become merely a picture rather than a full-on sensory experience. What if, all those years from now, you could remember the smells? The sounds? Strangers who approached you? How your heart beat? The feel of a smile spreading over your lips? Gravel crunching, traffic blaring? The burn of the desert sun? Salt’s scent on a seaside wind as you rounded a corner? 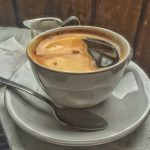 Tasting a strange, exotic tea? The decadent sweetness of rustic jam slathered on a butter-rich croissant at a Parisian sidewalk café, a swirl of French spoken all around you? Reading your words, being transported back to that place… Wouldn’t that make travel infinitely more valuable? Let me teach you the art of creative travel, of being in the moment and recording it for posterity. Together, we’ll unlock the beauty of Slow Travel and creating a blueprint for future reminiscing. Join me for five sensory-filled, mind-enriching nights in Fez, Morocco. We’ll explore the souk, devour traditional meals, watch cultures clashing, and workshop a creative memoir to cherish for years to come. When Fez is but a sandy horizon behind you, a wonderful record of your Moroccan nights will keep it alive. But, in years to come, these Creative Travel Workshop tools make your adventures richer, with records that keep memories vivid for decades. Full Nomad’s Morocco Creative Travel Workshop is from Thursday, April 27, 2017, till Tuesday, May 2, 2017. Email me if you want to be a part of this or if you have any questions. It will be a maximum of 11 attendees. *Four suite upgrades available for a surcharge. The Bab Boujloud (Blue Gate)—so named for the blue Fassi tiles on the outside—was constructed in 1913 by the French in a Mauresque-Andalusian style; the original 12th century entrance to the medieval medina sits beside it. The swirls-and-stars-patterned tiles switch to green on the inside, but from either direction it’s an impressive and bustling entry to the historic area’s 9,500 streets and alleys. Why Pick Fez for the First Creative Travel Workshop? I’ve always wanted to visit Morocco. Haven’t you? Something mystical and profound compels me there. I’ll be spending much of February and March getting my groove there so I can help you experience the real Maroc in our Creative Travel Workshop! The Medina (Old Town) in Fez has nearly 10,000 alleyways. Dating back over 1,000 years, these thoroughfares are too narrow for cars. It’s a pedestrian heaven loaded with rickety old push-carts and mules for deliveries. In fact, this is the world’s largest car-free area! 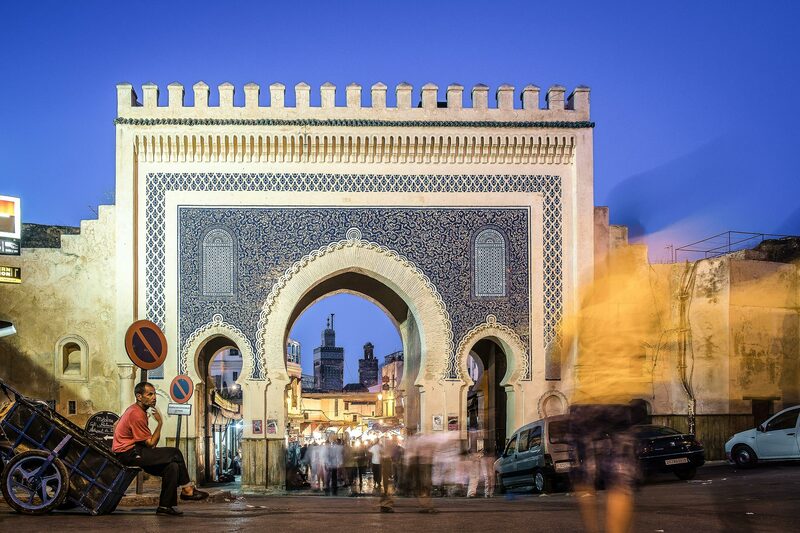 Higher education was born in Fez, where the world’s first-ever university began in 859AD, Al Karaouin University. It’s considered the oldest degree-granting university in existence, too. Fez has more than 400 mosques in the city, with more than half found in the Medina. It’s one of the best places on Earth to buy leather, with Chaouara Tannery being the oldest leather tannery on the planet. From bakers to cobblers, many trades exist in the same way they have since medieval times, making this one of the best places on Earth to get a feel for a different time and another way of life. Here are 20 other things to consider seeing, or doing, in Fez, according to Bloomberg. Between the chaos of mules and carts and crowded alleyways, the old world feel, the smells, the foods, the warmth… Could there be a better place for people to learn how to stop and focus on a moment, and record it for a snapshot in time? Fez’s brand-new international airport is expected to increase their tourism five-fold in the next decade or so, making this the perfect time to get in before it explodes. This means, despite a long-haul international flight, you’ll arrive just 20 kilometres from your lodgings. Flying directly to Fez from North America can range from $1,000 to $5,000 CAD, with as many as three layovers. Great prices can be had if you buy at least two months in advance, though. Another option, however, is to fly to Paris for two or three nights, then fly round-trip to Fez from there. Europe’s cheapest flights to Fez originate in Paris and, for some, it could be the perfect chance to visit two of the most-dreamed-about locations on Earth in one brilliant vacation. Either way, I suggest researching flights now, then “tracking” the flight prices in Google Flights, which can alert you to changes. That’s how I scored a $444 all-in ticket to Prague from Vancouver, which later sold for as much as $1,369. I swear by Google Flights with all my adventures. Learn all you need to know about Google Flights here, but choose YOUR currency in the settings, so you don’t get sticker-shock upon paying. Keep in mind, airlines often (but no guarantees) slash seat prices in January for some of the year’s best prices. Sometimes called “Dead Zone” sales, these low prices compensate for super-slow seasonal sales. Google should alert you to these prices too! But it’s easy enough to log in and open your tracked prices daily, and pounce when you’re ready. 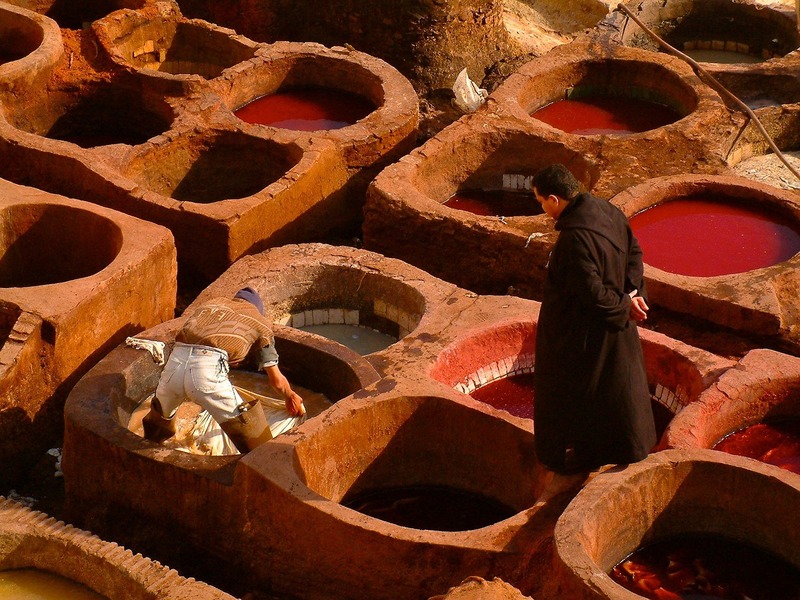 Moroccan leather tanners in Fez. Creative Commons image. Plans change and life happens, so a full refund is available on all deposits until February 21. Then, there will be a 50% refund until March 21st. After that, no refunds. This policy is firm. I’m also offering a three-month payment plan. For one-third the payment mid-January, then each of the next two months, being paid in full by March 21. All spots must be paid in full by March 21. Liability waivers, reservations, and payment specifications are available by emailing me.